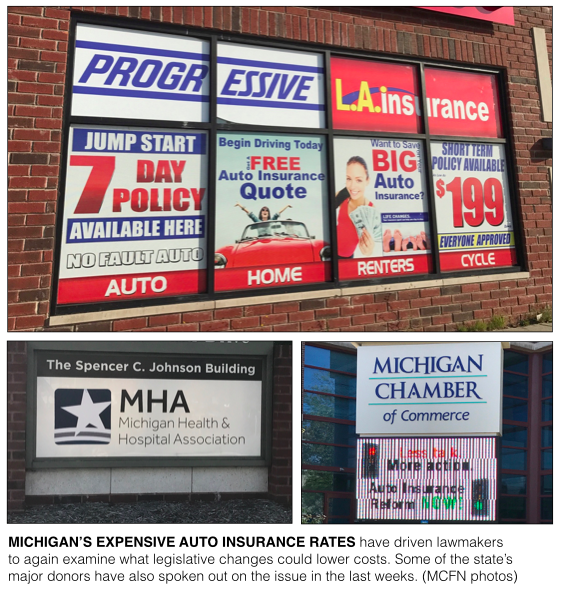 LANSING — When state lawmakers sit down Tuesday morning to begin debating how to overhaul Michigan’s auto insurance system, some of the state’s biggest donors will be watching with special interest. Insurance companies, business groups, trial attorneys and health care providers all have a stake in how Michigan’s more than 7 million licensed drivers get insurance and who pays when someone is catastrophically injured in a wreck. If past campaign contributions are any indication of what will occur in the Legislature this fall, things could be looking up for the auto insurance companies — at least among the lawmakers best positioned to influence the outcome. Political action committees (PACs) and executives tied to groups or businesses that have previously taken a stance on plans to overhaul Michigan's auto insurance system have given at least $704,795 to fundraising accounts tied members of the House and Senate insurance committees over the last five years. About 63 percent of the money, $448,530, came from those traditionally siding with proposals backed by the auto insurance industry. The majority of lawmakers on the committees — 17 out of 27 — have received more money from donors on the side of the insurance industry than from donors who’ve generally stood in opposition to the industry’s preferred changes. But there are major donors on both sides of this fight. The Michigan Campaign Finance Network (MCFN) looked at disclosed contributions to lawmaker-connected committees from auto insurance industry PACs, industry executives and business groups that have formally taken a stance in support of reforms previously, like the Michigan Chamber of Commerce and the National Federation of Independent Business (NFIB). MCFN tallied contributions from those who have previously opposed proposals backed by insurance industry groups. The opponents have included the Michigan Health & Hospital Association, individual hospital PACs, hospital executives and other rehabilitation-care providers who are compensated to treat accident victims. MCFN also tracked contributions by the Michigan Association for Justice, which represents trial attorneys, some of whom specialize in personal injury cases. There are likely other contributions from both sides that are untrackabe because they go to accounts tied to officeholders that don't have to disclose their funding sources. Committees connected to three lawmakers who are positioned to have the most sway over what happens this fall all have been major recipients of money from those advocating for major auto insurance reforms. 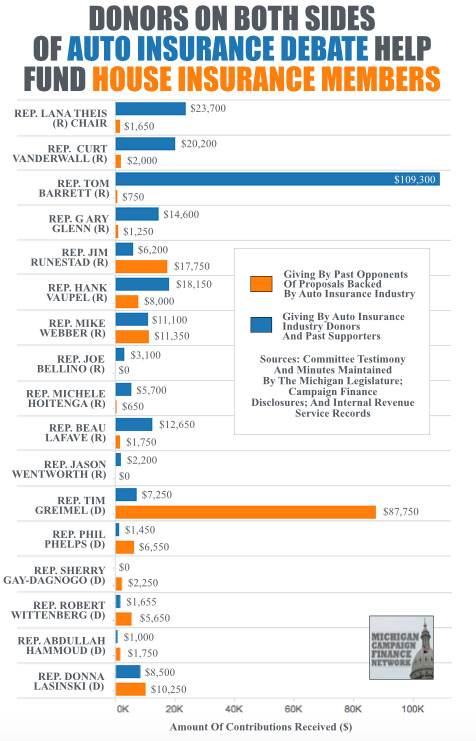 — House Speaker Tom Leonard, a Republican from DeWitt, who chaired the House Insurance Committee during the 2015-2016 session, has received $149,975 from auto insurance industry-connected donors over the last five years. Those on the other side of the debate have given Leonard only about $7,000. Leonard’s big donors include the Michigan Chamber PAC, which gave about $35,850, and the Automobile Club PAC, which gave $27,500. — Senate Majority Leader Arlan Meekhof, a Republican from West Olive, has received $82,050 from the insurance industry side of the debate while receiving $30,300 from those who’ve been in opposition previously. Meekhof’s connected committees have received $30,450 from the Michigan Chamber PAC over the last five years. — House Insurance Chair Lana Theis, a Republican from Brighton Twp., has received $23,700 from the insurance industry side of the debate while receiving $1,650 from those who’ve been in opposition. An account connected to Theis’ husband received $80,000 from an insurance industry lobbying group in 2016, as reported by MCFN earlier this year. Leonard and Theis, along with a diverse coalition of other supporters, including Detroit Mayor Mike Duggan, announced a plan to overhaul Michigan’s auto insurance system on Thursday. The goal of their plan is to lower Michigan’s insurance rates, which have been ranked the most expensive in the nation. The new proposal provides options for personal injury protection coverage. Currently, Michigan has a unique no-fault insurance system that provides unlimited personal injury protection coverage regardless of who’s responsible for the accident. The new bill, House Bill 5013, would give drivers the addtional options of choosing benefit limits of $250,000 or $500,000, which would come with lower rates. The new bill would also create a fraud authority, would put restrictions on attendant care for those severely injured in accidents and would establish limits based around the federal Medicare program for what health care providers can provide for services. Supporters of the bill say the changes will reduce auto insurance rates by about 20 percent on average. However, Brian Peters, CEO of the Michigan Health & Hospital Association, which represents hospitals, called the proposal a “nonstarter” in his association’s press release. Peters said the proposal “protects insurers rather than giving all drivers true rate relief.” Another key group in Lansing, the Michigan Association for Justice, which represents attorneys, also criticized the plan saying it was a “giveaway” to insurers. The Health & Hospital Association and the Association for Justice had the 11th and 18th largest PACs in Michigan during the 2016 election cycle, according to MCFN’s tracking. Of the lawmakers serving on the two insurance committees, Rep. Tim Greimel, a Democrat from Auburn Hills, has received the most money from the Michigan Association for Justice over the last five years at $41,250, according to MCFN's tracking. Greimel is the minority vice chair of the House committee and is a lawyer himself. The Michigan Chiropractic Society has also previously opposed past no-fault reform efforts, and its PAC ranked 101st in 2016. Individual hospitals have PACs that give to lawmakers’ campaigns, and executives of health care rehabilitation businesses that have opposed reforms also give to lawmakers. On the side supporting changes similar to what was proposed on Thursday, the Michigan Chamber of Commerce had the 17th largest PAC in 2016. There are many PACs tied to individual insurance interests: the Michigan Farm Bureau PAC, ranked 38th in 2016; the Automobile Club PAC, ranked 69th; the Michigan Association of Insurance Agents PAC, ranked 86th; and Frankenmuth Insurance PAC, ranked 109th. The Michigan Insurance Coalition, an insurance industry trade association, placed 113th in the 2016 PAC rankings. The House Insurance Committee is scheduled to begin considering the auto insurance reform proposal at 9 a.m. Tuesday. Of the 17 lawmakers on the House Insurance Committee, nine have received more campaign money from auto insurance industry donors than they have from past opponents of the industry’s preferred changes while eight have received more from the opponents. MCFN tracked $406,105 in total contributions from donors interested in the auto insurance debate to House Insurance Committee members over the last five years. Of that total, $247,755 — or 61 percent — came from donors who’ve traditionally aligned with the insurance industry. Those watching the issue play out in Lansing believe the committee’s looming vote could be close. The six Democrats on the committee are expected to vote no, while special focus is on three Republicans: Rep. Jim Runestad, of White Lake; Rep. Curt VanderWall, of Ludington; and Rep. Mike Webber, of Rochester. Webber and Runestad are both from Oakland County where the GOP county executive, Brooks Patterson, has been a long-time opponent of measures to limit catastrophic coverage. They’re also the two Republicans on the committee who have received more contributions from no-fault reform opponents than supporters. Runestad has received $17,750 from opponents while receiving $6,200 from supporters. Webber’s tallies are closer: $11,350 from opponents; and $11,100 from supporters. VanderWall is a first-term House member. He has received heavy support from auto insurance industry donors, taking $20,200 in contributions from supporters of industry-backed changes and just $2,000 from opponents. If the bill gets out of committee, it has a long road ahead. The bill would then go to the full House, where supporters will have to cobble together enough Republican and Democratic votes to advance it to the Senate. There, waiting for the bill will be Meekhof, the Senate leader who has expressed early opposition to Leonard’s proposal and previously backed his own reform ideas.